I can see that Houck has worked incredibly hard to present a very different culture from the usual YA fantasy romance - here, she presents a vision of India, all lush jungle, exotic food and strange mythology. I enjoyed having a different background to the plot. Unfortunately, I have to say that that was the best part of the novel. Tiger's Curse was simplistic and formulaic, at the same time, which meant my interest wandered even at key points. Other reviewers have talked about the breathless romance between Kelsey and Ren, but all I could see was all the other occasions when a teenage girl has fallen hard for a supernatural chap when she doesn't really know him! 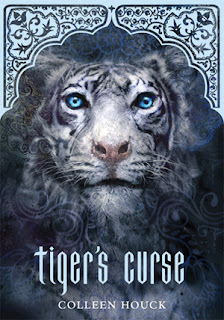 For me, the overwhelming feeling while reading Tiger's Curse was one of irritation. I got tired very quickly of the Dear Diary approach: 'I woke up. I got dressed. I ate breakfast. I spent time talking to a tiger'. Kelsey was a sickening character - one of those girls who is mystically powerful, beautiful but overly modest and seems to constantly require a man to protect her. The realism in the novel was lacking. I do understand I was reading a fantasy novel, and hence there will be some lack of realism, but this went to ridiculous levels: Kelsey is supremely talented at looking after a tiger, even though she has no prior experience of looking after dangerous animals. She decides that it will be fine to touch said tiger, because it "feels" as though he won't hurt her. She thinks it is fine to travel to India with a man she had met on two other occasions, in order to look after a tiger because she'll miss it after having spent just two weeks taking care of it. The switch between rather ordinary circus adventure/travel itinerary that comprised the first hundred or so pages (seriously, we are told the entire specs of the plane she travels on to India; we hear about various hotels she stops at) and the supernatural quest/Indiana Jones tale that finished the novel gave me whiplash, it was so sudden. And when I say Indiana Jones, I mean it - we have a whole sequence where Kelsey and Ren have to deal with a tomb that throws up unexpected surprises, such as bugs and spikes through walls. I ended up rolling my eyes so many times - not least when Kelsey starts to over-analyse her relationship with Ren. I mean, she's clearly attracted to him and kisses him often, but Houck decides to string this out through the last third of the novel, with an entirely unconvincing resolution. Altogether Tiger's Curse was about two hundred pages too long, and shared far too many similarities with other YA fantasy romances. It frustrated me more than it thrilled me, and I would say categorically that I have no intention picking up the other two novels in the trilogy. I HAVE A STRANGE FEELING "REN" AND "DHEREN" MIGHT BE THE SAME BEING UNDER A "TIGER'S" "CURSE", AMIRITE? This sounds awful, and problematic as hell along various axes with the exotic, magical Indians. Ooh I read Viv's review before I read yours. What totally different takes on the book - almost like you read two different books! I do still love that cover. However it sounds exactly how I felt when I read Angel. Maybe one for me to borrow rather than rush out and buy. I am from India so I would like to read this book and see how it was potrayed in this book even though I really don't want to read a book about a Tiger Curse. Well, I disagree with your review on several levels, as I thought the book was fantastic in so many ways. First off, the MC never claimed, nor did anyone character in the book, that she was "supremely talented" in caring for a tiger, only that she was capable for a short period of time. Of course, we know now that Mr. Kadam had his reasons for wanting to take her on, and he only did so AFTER meeting with the MC's foster family and they approved of him. So it was an absolutely plausible scenario. Also if I spent as much time as the MC did with tiger tiger, I would eventually want to touch the big cat. The MC looked into his eyes and thought she noticed something human or tame about the tiger and I would definitely take the chance to touch it. Another very plausible scenario. Maybe you wouldn't take that risk, but many teenage girls would! Finally, I really enjoyed the end where the MC overanalyzes her relationship and I can totally relate to that. In the end she makes a decision that shows her maturity and wisdom, even though I disagreed with it. It raised my estimation of her and the author! After finishing it, I rushed to buy book 2 (what a gorgeous cover!) and it was even more amazing. You should definitely give it a try!